D.A.G. 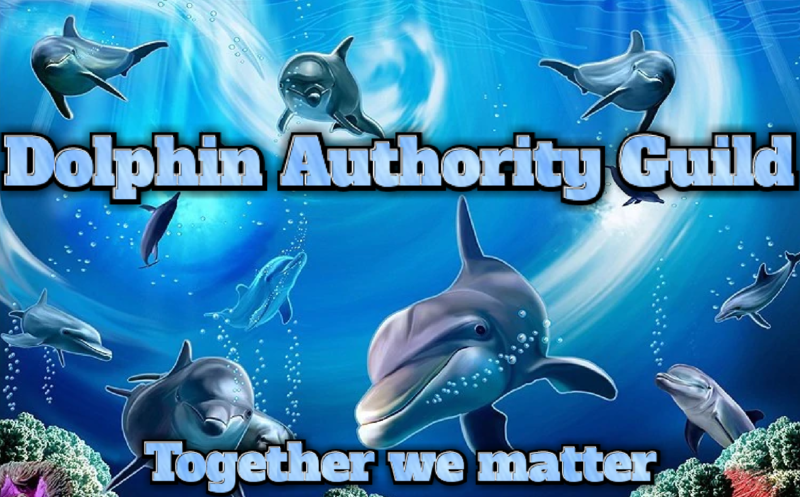 - Dolphin Authority Guild: A Guild for dolphins empowered by... dolphins! If you are a dolphin and are struggling to find success although you do your best producing content, doing projects or being engaged on the steem blockchain one way or another for the better of the community, maybe this guild is for you! D.A.G. is here to put the focus on an important, yet forgotten group on the steem blockchain: The Dolphins! Dolphins have the advantage that we are many more than whales and we our votes still are enough to help smaller fishes out. Yet, alone our votes don't really matter that much when it comes to ourselves. There's a lot of dolphins who does a lot of great stuff on the steem blockchain but still struggles to get the support or recognition. Simply because whales are too few to help everyone out and many of us end up drowning with the other fishes in the ocean. On the steem blockchain, there's a ton of projects focusing on helping the "new" people or as we call them "minnows and redfish" to drag as many people into the platform and make them stick around. But with all the focus on "the new steemians" we do tend to forget our Dolphins, an already loyal and valuable group, that are already serious about steem and steemit, but struggles just as much. Those who invested at least 5000 Steem power are usually considered to be Dolphins. But as a dolphin, you are kind of in a weird spot compared to whales and minnows. On one side you do have some influence with your vote, yet, not truly enough to make a big difference. I know a lot of people including myself, that are in this spot they try to find ways to make Steemit a serious part of their life, but simply because of the competition, struggles to do so. It's a feeling of almost made it as a full-time steemian but yet, not quite there. Many ambitious Dolphins trying to post and engage the best they can on Steemit because they want to be part of the steem future and in all honesty, it is a rare sight to see a dolphin power down, usually we stick with what we got and want more! For a whale, powering down 1000 steem power feels like a drop in the water, but for a dolphin, it is a direct hit in the soul. By creating a guild where dolphins can network and support each other, could, in the long run, save a lot of dolphins from giving up on the dream and ultimately save a lot of Steem to be sold. D.A.G. is here to solve this problem, while we are alone we might stand weak, but together we matter! We just need a place to find each other! More power to the dolphins! Our votes matter, but they don't matter enough. The guild wants the serious dolphins to play a bigger role in Steemit and increase their Steem power as much as possible by helping each other out. Since they are already in a strong position and are not likely to power down any large amount of SP down, it would make sense to help and focus some of the payouts to this loyal group of the steem ecosystem. The best part? We don't need anyone but ourselves to make this happen! Every member delegates 3000 Steem Power! For the small dolphin, this should be about 50% of your Steem Power. In return, you will receive some great benefits from the guild that will without doubt making those 3000 Steem power worthwhile. Why 3000 SP? The scale of a dolphin can differ a lot and we want the smallest dolphins also to have a chance of joining in. We don't want the dolphins to use all the steem power only to the guild, but still, have remainings to do with whatever they please. Maybe the 3000 SP can be a bit scary, but there's little commitment to try it out and a lot to gain from it! We want to use the fact that dolphins are already quite powerful to our advantage and that is why we got such a high threshold. If you are close to be a dolphin and feel like the 3000SP would be worth the investment, you are free to apply to the guild. 3000SP is what we are starting with and depending on peoples need we might reduce or raise it. (this will be discussed between the first 10 members.) The more we are able to contribute, the bigger return we will get and here is why! The benefits of the guild! D.A.G. voting concept: When you delegate the 3000 SP @dolphinauthority will vote 1 of your post a day with a % depending on the size of the Guild. Currently, Starting out the aimed size is 10 members to keep the community small and engaged with each other and also to work out the details of the guild. When we reach the maximum number, we will increase the size if it seems fitting for the community since expanding the membership would be in everyone's interest for better support and reward in the end. D.A.G. can vote 10 times a day so that would be a 30.000SP worth of upvote a day for each member. basically meaning that your 3000 SP would be ten times more. Regardless of how big the guild becomes. Everyone contributes the same, everyone gets the same. There will be a discussion about increasing or decreasing the SP delegation requirement early on in the guild to find the perfect balance. Remember! the more required to delegate from people, the more we will all get a return in the end! All curation D.A.G. makes will go directly into Steem Power to maximize the votes for members of the guild. This means as time goes by our members will keep receiving stronger and stronger votes. Also, D.A.G. votes are exclusively for the members! This concept makes sure that even if we are on our own, we will make a difference together! But that's not all though! As a dolphin, we all know how crucial it is to network with others. In fact, some people claim it might be even more important than the content itself you produce and there's a lot of profs for that. The rewards for the members is one part of the guild. The other part is a good place building a network between each other. Of course, our discord channel is the main hub and where everyone can find each other. Not only do you know everyone else here also are somewhat "influential" since we are all dolphins, but also that everyone in here is because they are creating something of value to the steem blockchain. Meaning that finding like-minded people should not be a problem. There will be weekly posts and contests that members can participate in. When the guild gets big enough, we will also start creating prize pools for members to win! These competitions can be everything from creative articles to other projects one way or another! The Guild is exactly that, a guild! Every member can join in on the project if they wish to do so and together we can shape it to the best of our needs! Surely @holm founded this project, but he wants people to participate in it! How many members until the Guild begins? 10 members will be the golden number. Before that, we slowly pull people into the discord chat and from there I will give the signal to the 10 committed people to delegate the Steem power! It might not sound like a lot, but finding dolphins willing to delegate 3k SP will be a bit harder to find than 100 minnows and since it is important to take the right members in this will be a vital part of the beginning. Why at least 10 members? Because that is the number where the relatively large amount of SP we all have to delegate will start paying off. When we have passed the 10 members it will be smooth and @holm together with the members will recruit people as time goes on with, hopefully, expand the guild and its potential. D.A.G. is not just gonna be another automatic voting service with little to none interaction. The purpose of the Guild is to help people who not only invested money but also time into the steem blockchain. This means the 3000 SP is only one part of the requirement. The next is YOU have to be the right material that provides good content or engagement to the steem community. This means your investment in the steem blockchain is one requirement, but your commitment, talent, and skills are just as important. If you feel like you create engagement and value to the steem blockchain, you should grab the chance to join in! Want to join the D.A.G.? This is what you have to do! When added we will start a little chat interview. From here we will have a short interview. When accepted, you will get a link to the discord channel for the other members to easier engage and connect with each other. As soon as you have done this, you will be added to the voting list. IMPORTANT: If you are among the first 10 members, don't do this step just yet, until we got enough members to start the journey! Also, you will get a badge to slap on your posts profile or posts to promote our initiative and bragging rights(Only if you feel to do so). Join D.A.G: contact holm#6624 on discord! This looks like a great initiative!! I tried to add #6624 as a friend, but it did not work. I must say I am not really ai fait with Discord. I basically never use it. Thank you, it went through!! I will be in touch although atm 3000 SP is nearly all of my remaining SP after a few delegations. It's a little steep as a starting point atm. I might be investing more shortly though, maybe after that. I did note that the amount was under discussion... doesn't dolphin cover everyone from 5000 to 49999 SP - near enough! We are all humans and not so strict with the numbers of our account, if you wish to join you are free to apply mate:) No problem that you are not a dolphin just yet! Haha... human... good to hear. @ 10.05 Mvests I am a dolphin btw! Dolphin no 1760. I'll look you up on discord - should have some free time tomo. Do you feel it is a good return for the delegation? I was trying to work out the vests. It's moot working it out - that'd be all my remaining SP! I understand that - me too! I was planning a bit of self-tracking tomorrow to see how I'm doing, could consider how the two compare. I'd be happier starting with 1,000 though. Great initiative. Doing this little for own little groups will make everyone have decent sp. You got a 26.03% upvote from @postpromoter courtesy of @holm! Great Idea I'm almost a dolphin with 4640 SP. I will be watching this project thank you! You are still welcome to join in even though you are a little under:) Right now I am just gathering people who would be willing to band together to give it a go! I also do some personal recruiting, this post is basically just so I can lead people to here if needed! I strive to be a dolphin. See you guys in a year. Great! I will be keeping an eye on this. Not even close to being a dolphin yet. But one day! Great post. I think dolphin is the way to go. I was in hope someone would do this at some point I think its a great idea, I just had my 2nd Steemit birthday, have never powered down once and I am just under 950-sp to go until I reach dolphin, once I am there I can see this being beneficial and would likely join. Hey guys ,am new here but thanks @dolphinauthority for judging this issue . I have yet to reach the level of a dolphin but this is something that I am interested in. Only one vote per day? Whats the weight of upvote? Do you hsve quality checking? The weight of the upvote depends on how many members there are. Right now, there are no weight because we will not start the guild unless we get 10 members. The quality check comes through interviewing the members before they become members. It is not a quantity project. See it like if you get a job, usually the quality check there is when you try to get it. Sound too sketchy for me. Well good luck! I don't see any sketchy in building a community and people contributes by delegating SP. But each to their own:)! In fact that the guilds waits with launching and making people first delegate when there's enough members should prove otherwise? Think i managed to send a request on discord but if not I am interested! @dolphinauthority - Just out of curiosity, how many members are you sitting at currently? Before this year ends I WILL be a dolphin! I am promoting #steem with my friends and believe it is a great platform for people that want to share and produce content.